Disregarding Going Overboard this is the worst film I have ever seen. 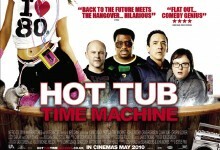 Also, considering the fact that Back to the Future is my favourite ever film, Hot Tub Time Machine was quite insulting. For starters, the plot was completely predictable; they got in a hot tub, ended up in 1980-something or other because some illegal beer had gotten into the controls and thought that they had to repeat history so that they could get home. Pathetic. So, they have to fight this guy for their illegal beer back so they can break the time machine again and go home. Guess what? They actually get home. Well, that’s surprising. What’s more is that one of the guys turns out to be the kid’s father. Shocker. To be frank, it’s more like a Jeremy Kyle episode than anything else. The nostalgia was terrible; people catching the film in the middle will not have realised that it is based in the eighties. Yes, fair enough, the fashions have come back, but the director could have used a slightly different hue filter for the camera, or at least used nostalgic references. The only thing that made it in the eighties was when one of the guys asked a woman what colour Michael Jackson was and she answered black. But, this was in the film trailer which was broadcast on television screens nationwide! So that ruined it. I did enjoy, however, the on-going mystery as to how the porter (played by Crispin Glover) lost his arm. This was quite funny as it looked like he lost it on numerous occasions and it was frustrating the main characters because he kept waving at them with both arms. Perhaps this was Glover’s suggestion? Haha. All-in-all I think that despite their feeble efforts, this film was a disgrace to honour Back to the Future and shouldn’t relate to it at all. The time-travelling aspect isn’t accurate – which is not a huge issue as Back to the Future and many other time travel movies have errors in them in this area, naturally – the comedy side of it was not that funny and the plot was quite wet. I would not see this again or recommend it. Ever.